Background/aims There is considerable interest in novel techniques to quantify choroidal blood flow (CBF) in humans. In the present study, we investigated a novel technique to measure CBF based on laser speckle flowgraphy (LSFG) in healthy subjects. Methods This study included 31 eyes of 31 healthy, non-smoking subjects aged between 19 and 74 years. A commercial LSFG instrument was used to measure choroidal vessel diameter (CVD) and relative flow volume (RFV) in choroidal vessels that were identified on fundus photos, an approach that was used previously only for retinal vessels. The reproducibility and the effect of isometric exercise on these parameters were investigated. The latter was compared with measurement of subfoveal CBF using laser Doppler flowmetry (LDF). Results Intraclass correlation coefficients for CVD and RFV were higher than 0.8 indicating excellent reproducibility. During isometric exercise, we observed an increase in ocular perfusion pressure of approximately 60% (P<0.001). The increase in RFV and CBF was lower, but also highly significant versus baseline (at minute 6 of isometric exercise: RFV 10.5%±4.2%, CBF 8.3%±3.6%; P<0.001 each) indicating choroidal autoregulation. Conclusion LSFG may be a novel approach to study blood flow in choroidal vessels. Data are reproducible and show good agreement with LDF data. Trial registration number NCT02102880, Results. The study population consisted of a subgroup of healthy subjects, who participated in previously published studies.22 23 All research adhered to the guidelines set forth in the Declaration of Helsinki. Written informed consent was obtained from all participating volunteers after the nature and possible consequences of the study were explained in detail. Those subjects in whom a choroidal vessel was clearly identified were chosen for the present analysis. For reproducibility analysis, we included 21 subjects, and 10 subjects were included for the analysis during isometric exercise. Prior to the study, all subjects underwent a comprehensive screening examination comprising medical history, physical examination, best-corrected visual acuity testing using standard ETDRS charts, slit-lamp examination including indirect funduscopy, measurement of intraocular pressure (IOP) using Goldmann applanation tonometry, measurements of systolic blood pressure (SBP) and diastolic blood pressure (DBP) with automated oscillometry and a urine pregnancy test in women with childbearing potential. The inclusion and exclusion criteria of the study were published previously.22 23 Twelve hours prior to the study, subjects were instructed to abstain from alcohol and beverages containing xanthine derivatives such as tea, coffee or cola. In the present study, we used a commercially available LSFG system (LSFG-NAVI; Softcare Co, Fukuoka, Japan) to study CBF. The principles of LSFG have previously been summarised in detail.18 Briefly, the device consists of a fundus camera supplied with an 830 nm diode laser and a digital charge-coupled device camera. The output parameter of LSFG is mean blur rate (MBR), which constitutes a measure of relative blood flow velocity in arbitrary units (AU) and is calculated using first order speckle statistics. One LSFG scan consists of a total of 118 images captured at a rate of 30 Hz resulting in total measurement time of approximately 4 s. The analysis software (LSFG Analyzer, Version 3.1.58; Softcare Co) produces a ‘composite map’ which colour codes perfusion at the posterior eye pole within one cardiac cycle. Recently, a technique was introduced to extract blood flow information from retinal vessels. For this purpose, a rectangular band (RB) is centred on the retinal vessel of interest. The signal from this area contains information from the blood stream within the vessel as well as from the microvasculature beneath the vessel. The signal arising from the larger vessels can automatically be separated from background MBR originating from the surrounding microvasculature by computing a threshold between MBR values. The software extracts the vessel diameter as expressed in pixels as well as the relative flow volume (RFV) in AU. In the present study, we extended this concept that was originally developed for retinal vessels to choroidal vessels (figure 1). Larger choroidal vessels were identified on fundus images and LSFG intensity maps. The vessel selection was restricted to the 21° field of view of the LSFG camera, which was centred at the optic nerve head. Afterwards, a RB having three times the width of the choroidal vessel of interest was placed over this vessel in the LSFG perfusion map and analysis was done in a similar way as previously described for retinal vessels.21 During the vessel selection, we took care to draw a RB which encompassed the choroidal vessel of interest without including any other larger vessel. The size of the RB on the first scan was saved and then exported to all the following scans for each subject. Identification of choroidal blood vessels for Laser Speckle Flowgraphy (LSFG) analysis. (A) First a choroidal vessel is identified based on a fundus photograph. The choroidal vessel of interest is shown inside a white rectangular band that is manually placed. (B) The presence of the choroidal vessel is then confirmed at the LSFG intensity image. (C) In the perfusion map, a rectangular white band is traced across the vessel which appears red because of the high intravascular blood velocity. SBP and DBP were measured using an automated oscillometric device. Mean arterial blood pressure (MAP) and ocular perfusion pressure (OPP) in the seated position were calculated as follows: MAP=DBP+1/3(SBP–DBP), OPP=2/3 MAP–IOP. A κ of 1 means perfect reproducibility. The higher the intraclass correlation coefficient, the less is the variability of the method. In addition, the coefficients of variation were calculated. A P value of <0.05 was used as an indicator of statistical significance. All statistical analysis was carried out using CSS Statistica (Version 6.0, Tulsa, Oklahoma, USA). Demographic and baseline characteristics of subjects. 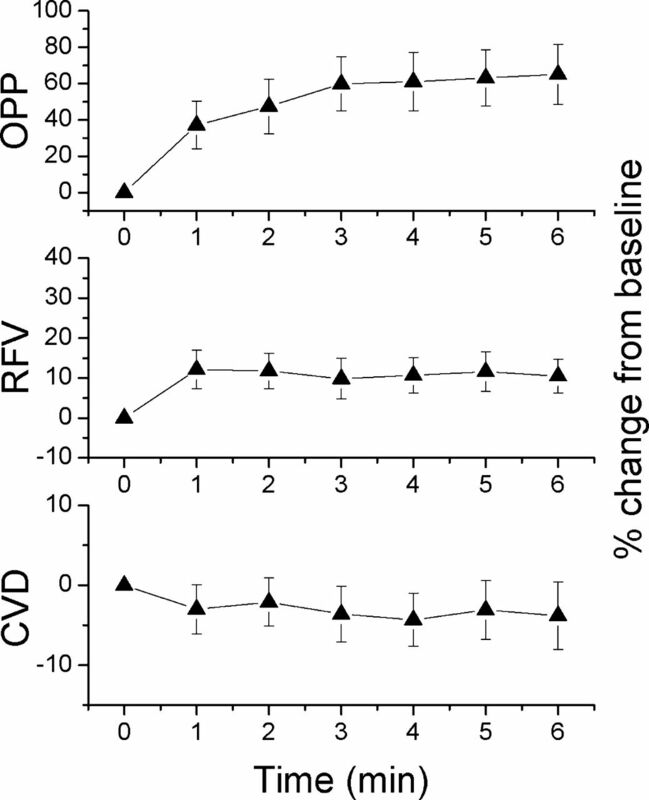 Changes in CVD, RFV and OPP during isometric exercise are presented in figure 2. The CBF and OPP data as obtained during the second period of isometric exercise are presented in figure 3. The increase in RFV, CBF and OPP was highly significant (P<0.001 each). 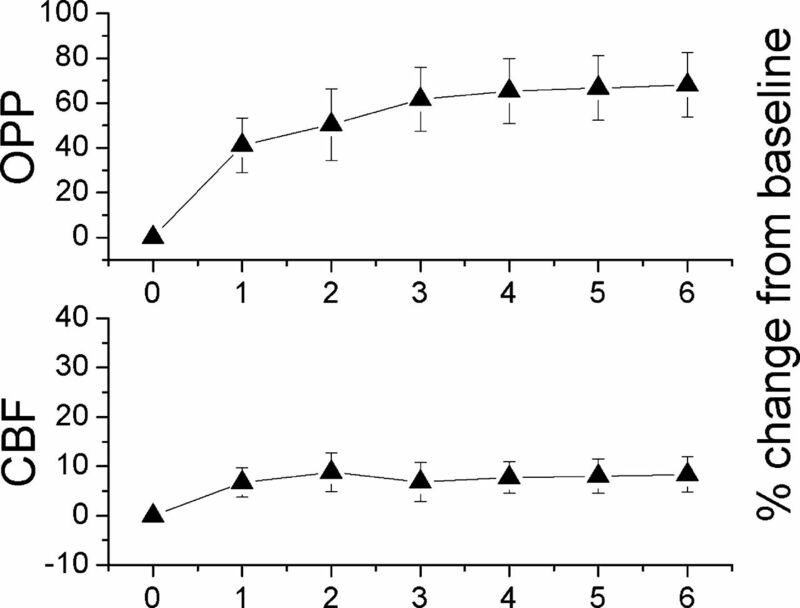 The per cent change in OPP was, however, more pronounced than the increase in RFV and CBF indicating choroidal autoregulation. When we compared the time course of RFV and CBF, we observed a slightly higher increase with the former parameter (at minute 6 of isometric exercise: RFV: 10.5%±4.2%, CBF: 8.3%±3.6%). These data were, however, obtained during different periods of isometric exercise, but differences between the OPP increase during the two periods were small. The choroidal vessel diameter showed a tendency to decrease during isometric exercise, but this effect was not significant (at minute 6 of isometric exercise: −3.8±4.2%; P=0.08). Ocular perfusion pressure (OPP), relative flow volume (RFV) and choroidal vessel diameter (CVD) during isometric exercise. Data are expressed as per cent change from baseline. Data are presented as means±SD (n=10). Ocular perfusion pressure (OPP) and choroidal blood flow (CBF) during isometric exercise. Data are expressed as per cent change from baseline. Data are presented as means±SD (n=10). Herein, we present a novel approach to quantify CBF based on LSFG technology. The approach provides acceptable reproducibility and is capable of characterising changes in CBF induced by isometric exercise. Given that there is currently no other method commercially available for obtaining quantitative information on CBF, this technique may have considerable potential for understanding choroidal perfusion abnormalities in diseases of the outer retina. The increase in CBF as observed with this technique during isometric exercise was slightly larger than the changes as obtained with LDF, but followed the same direction. In this context, several important differences between the current approach and LDF need to be mentioned which may account for these differences. On the one hand, LDF assesses the microcirculation in the subfoveal choroid, whereas the LSFG-based technique selects one larger vessel. As such LDF measures blood flow in choriocapillaris and LSFG measures blood flow in single vessels in Sattler’s or Haller’s layer. A major advantage of the present approach is that it relies on a commercially available technique that can easily be implemented. There are, however, also several drawbacks with the technique. On the one hand, we were not able to identify choroidal vessels that were suitable for analysis in all participating subjects. On the other hand, we and others have previously shown that there may be a zero-setoff with RFV measurements when applied in retinal vessels.21 29 These conclusions were drawn based on comparison with other techniques to measure retinal blood flow such as laser Doppler velocimetry or Doppler OCT.30 31 This may also be the case when measurements of RFV are applied to choroidal vessels, but due to the absence of a gold standard technique for CBF evaluation such validation experiments cannot be performed in choroidal vessels. Since LSFG is based on a decorrelation analysis one may, however, assume that the outcome parameters do not scale linearly with blood velocity over the entire velocity range.14 Reproducibility of our approach is in the same range to that of previous techniques for the assessment of CBF6 such as pneumotonometry,32 laser interferometric measurement of fundus pulsation33 and LDF26 and superior to that of colour Doppler imaging of retrobulbar posterior ciliary arteries.6 Further studies are required to investigate what is the minimum diameter of choroidal vessels that can be studied with this approach. In conclusion, our data indicate that quantitative blood flow information of choroidal blood vessels can be extracted using a commercial LSFG system. Future studies are warranted to investigate the potential of this technique in studying CBF in diseases such as AMD in which perfusion abnormalities are assumed to play a role in the development of late stage disease. The LSFG instrument was provided for free by Nidek. The company did, however, not influence data collection, evaluation or interpretation.
. Choroidal blood flow in the foveal region of the human ocular fundus. Invest Ophthalmol Vis Sci 1994;35:4273–81.
. Blood velocity and volumetric flow rate in human retinal vessels. Invest Ophthalmol Vis Sci 1985;26:1124–32.
. Choroidal blood flow during isometric exercises. Invest Ophthalmol Vis Sci 1997;38:2338–43.
. Autoregulation of choroidal blood flow in the rabbit. Invest Ophthalmol Vis Sci 1992;33:2399–410.
. Ocular perfusion pressure and choroidal blood flow in the rabbit. Invest Ophthalmol Vis Sci 1995;36:579–85. Contributors GC: conceptualisation, formal analysis, investigation, methodology, visualisation, writing the original draft. KF, AMB, NL and PAW: formal analysis, methodology and investigation. KJW: investigation and project administration. MB: funding acquisition and methodology. AP-C: conceptualisation and project administration. RMW: conceptualisation, formal analysis, investigation, methodology and supervision. DS: conceptualisation, formal analysis, investigation and methodology. GG: conceptualisation, formal analysis, investigation, methodology, supervision, validation and visualisation. LS: conceptualisation, formal analysis, funding acquisition, methodology, project administration, supervision, validation, visualisation and writing the original draft. All authors contributed to writing, reviewing and editing the final manuscript. Funding Financial support from the Austrian Science Fund (Fonds zur Förderung der Wissenschaftlichen Forschung; www.fwf.ac.at) Grant 21406 and project KLI 340 is gratefully acknowledged. Ethics approval Ethics Committee of the Medical University of Vienna.